Driving only 50km/45min from city of Tallinn You may unexpectedly discover that You have been traveling 8,000km into the west - North American native indian campsite back of couple of centuries. On our camping site you can camp with your mate, your family or with friends up to 40 people. 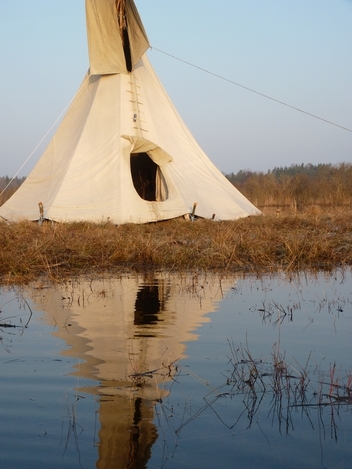 We provide native american indian style tipis for staing overnight around cosy fire. You just need to bring a duvet or sleeping bag and food. You can cook in the open air over a fire pit. We give you pans and pots - so you don´t have to carry yours. We can organize canoe trips thru wilderness including Tipi picnic.